Welcome to the Ogress city of Oo'glog, featuring the world famous Ogress spa pools, and a creature unique to just this area, the Platypus. Used mainly in the quest As A First Resort, the town is also home to a variety of useful resources, shops, NPCs, and a bank. The most accessible method, use an enchanted emerald ring to teleport to the Castle Wars arena, walk as far as you can south, then simply walk east. For more information on enchanting, see the Magic guide. After completion of the "As A First Resort" quest, you will be able to use the charter ship to come to the city from any major port. (For a reasonable price that is) Locations where you can travel from are as follows: Port Sarim, Brimhaven, Catherby, Port Khazard, Karamja, Ship Yard, Port Phasmatys, Port Tyras, and Mos Le'Harmless. For more information on Charter Ships, see the guide. After starting the "Fairy Tale Part 2", you will be allowed use of the Fairy Rings. You must have either a Dramen Staff, or Lunar Staff (After Lunar Diplomacy) to use fairy rings. 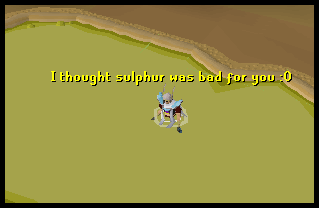 Simply find any fairy ring throughout RuneScape, and use the code A K S to arrive in Feldip Fields. After teleporting, walk south to the city. For more information on fairy rings, see the guide. To access Gnome Gliders, you must complete the "Grand Tree" quest. To access the Feldip Fields fairy ring, you must first complete the "One Small Favour" quest. At any gnome glider, select to return to Grand Tree (Ta Quir Priw), and then select Feldip Fields (Lemantolly Undri). From here, you can walk south to the city. For more information on Gnome Gliders, visit the guide. 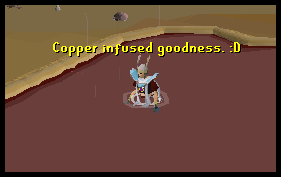 It is not recommended, but you can also teleport to Yanille using Modern Magics. If your house is located in Yanille, you can use House Teleport at magic level 40 (1 Law, 1 Air, 1 Earth) and then exit your house. If you don't have a house in Yanille, but you have finished the Watchtower Quest, you can use Watch Tower teleport at 58 (2 Earths, 2 Laws) and appear just north of the Player Owned House Portal. From either option, it is a long walk south to the city, but watch out for Ogres. See the Magic guide, and Construction guide for more information. Another way to get to Oo'glog is by hot air balloons. 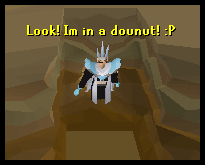 If you've finished the Enlightened Journey quest, and have unlocked the route to castle wars, for one willow log, you can travel there. From Castle Wars, follow the coast down to the furthest south point, then head east. For more information on unlocking balloon routes, visit the guide. Tip: Click an icon or area on the map above to learn more about it. The house of the ogress chief Tess, also lends itself to the start location of the quest "As A First Resort" Quest, which is required to use most of the things in the city. Tess lives here with her pet, Dawg, a "tame" Larupia. During the quest, Tess will explain how to hunt the creatures within Oo'glug. 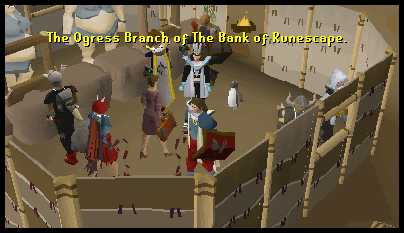 After starting the quest, you will gain access to the Ogress Bank. You can access your bank account, change/cancel PIN numbers, collect Grand Exchange sales. Also in the bank, you will find Balnea, a main character within the quest, and the one that wants to turn Oo'glog into a resort. After the quest, Balnea will explain how to care for Platypuses. Outside the bank is a good area for Firemaking. After completing the quest, you will also be able to use the Salon. There are a few things you can do here to enhance your ogress appearance. 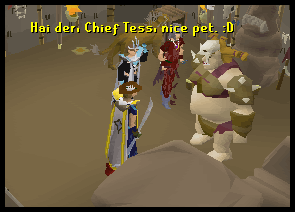 For example, you can talk to Kringk, and buy a ogre wig for 50gp. 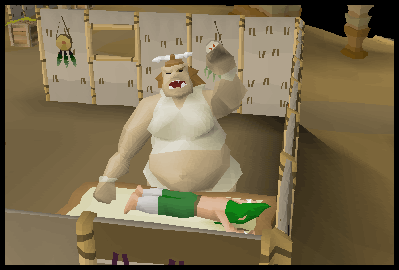 Also, you can talk to Muggh and get a ogress style facial for free. After completing the quest this building serves no purpose. At level 29 Agility, you can climb through this hole to get easy access to Oo'glog without needing to go past the Ogress Champions. You get no agility experience for going through it, and you can not fail it. Inside this house lives Seegud, who is another main character within the quest. After the quest, if you talk to Seegud again, you will be able to inquire to the uses of the five ogre spas. See below for details as to what each pool will assist you with. After completion of the quest, you will be allowed to use the pools free of charge. The Mud Bath serves two purposes. The first is that it will give you a temporary Hunting level boost of +8. As well, it hides your scent, as if you were smoking all your traps. When you soak in this pool, your run energy will be restored. As well, your pace will be quickened, so that you never run out of run energy. Sadly, these effects are only temporary, and after about 25 minutes, the effects will be negated. 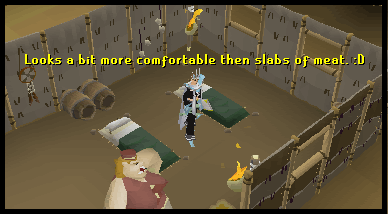 Some people find this very useful while training Agility or while Runecrafting. This may be one of the more useful pools, as it restores not only your Life Points, but also cures you of poison or disease. 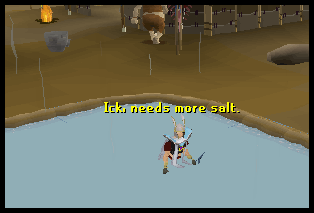 After soaking in the thermal pool, you will also notice that you have extra Life Points, much to the same effect as a Saradomin Brew. The amount of Life Points added to your health is determined by your Constitution level. You will also be immune to disease for about 20 minutes. The Sulphur Spring acts as a make-shift altar for recharging your Prayer points. Once you have left the spring, your Prayer points will be fully restored, as well as boosted by +8 levels. These extra Prayer points work in the same way as the altar in The Monastery, or the Nature Altar from the grotto in the Nature Spirit quest. 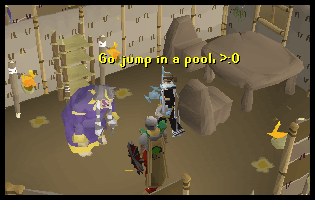 While it seems that the Bandos Pool has no visible effects, it is useful because it acts as a Bandos item within the God Wars Dungeon, causing Bandos creatures to become non-aggressive towards you for one hour. This is particularly useful because of the rarity of these items. Around Oo'glog, you will find a variety of Eucalyptus trees, a type of tree that plays a large part in the As a First Resort quest. These trees are good for woodcutting training as they are relatively close to a bank, and can net over 40k exp in a hour. Surrounding the city are a mess of Wolves (Level 64), Ogress (Level 69), Ogress Warrior (Level 86), Ogress Champion (Level 99). These are fairly good for training, as you can use the Pools in the city to Heal and restore your Prayer. If you are going to be cutting Eucalyptus trees, your going to need to protect yourself from them. Note: You can trade a Diseased Kebbit Fur to Frawd for a Davy Kebbit Hat. The hat has no bonuses as it is just for looks.